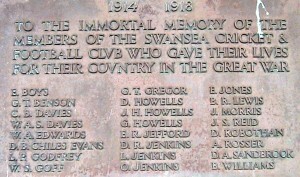 In addition to the ‘official’ war memorials to the fallen that can be seen in public places around the towns and villages of Wales there were thousands of memorials dedicated to First World War servicemen by private institutions – chapels, workplaces, schools and clubs. 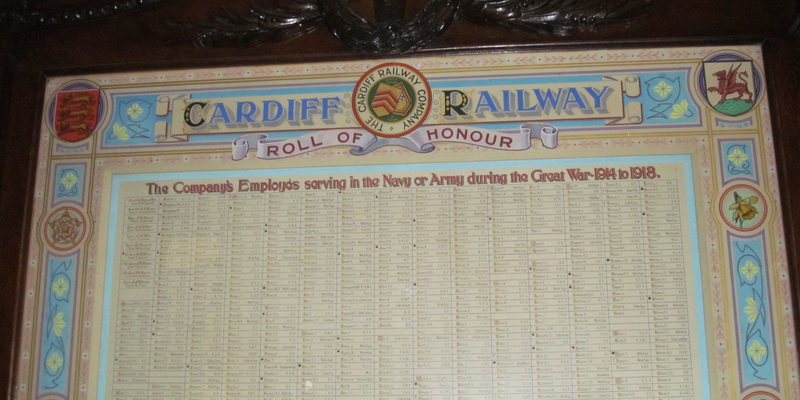 Most of these are not included on the available databases of war memorials. Many of these have been lost as the workplaces and chapels have closed down and the schools have relocated; many of those that remain are vulnerable. This project aims to preserve the information that is on these memorials, and to share images of them and any research that has been carried out into them. One important area of research that will be assisted by this project is the exploration of how the First World War impacted upon local communities. These ‘unofficial’ memorials commemorate the contribution of members of a select local group to the war, and as such they can be analysed both for what they tell us about individual lives and for what they convey about the community’s involvement in the war. ‌Another area of research is the study of the diverse reactions to the war and its different impact upon local communities. Gathering a range of memorials in one database will allow us to gauge how and why there were variations in the tone and scale of commemoration of the war. 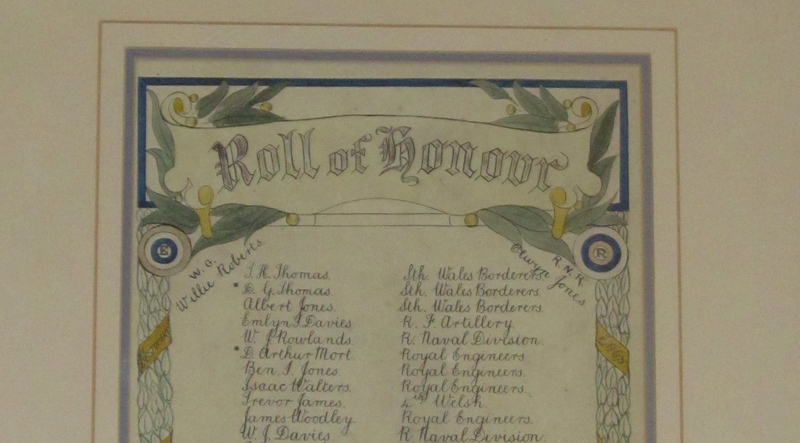 For example, some organisations (chapels, workplaces and schools) produced ornate Rolls of Honour to remember all who served, while others only had simple memorials to those who fell. What factors might explain these different reactions? Are there differences between memorials paid for by employers and those funded by the workers? What are the differences in commemoration between organisations in coal mining / iron / tinplate / slate-quarrying / agricultural areas? While most chapel memorials only list the men who served, some commemorate the contribution of women as nurses and munitions workers: what patterns can be seen here? 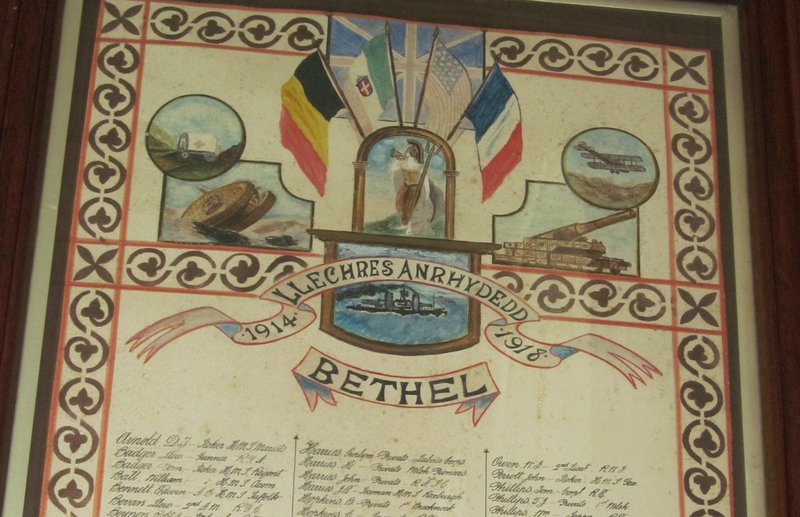 The core output of the project will be a database of WW1 memorials in Wales, to be shared via the ‘Wales at War’ portal and the ‘People’s Collection Wales’ website. 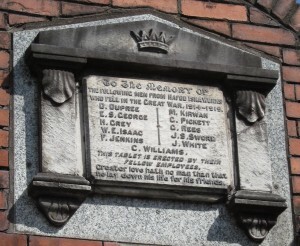 As well as making available images of these memorials, we will share any information that has been gathered about the servicemen by local historians, schools and societies, in particular those funded by the HLF. We will also produce on this website a series of articles aimed at a general audience that explore some of the themes that arise from the research.